The right to be forgotten (RTBF) in the European Union has sparked huge controversy. People in the EU have a right to request search engines to remove links to articles that are out of date or otherwise inadequate from searches of their names. But the contours of this right are still being developed. Much of the task of developing the right has been left to Google. 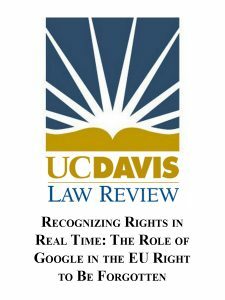 In this forthcoming Article, Prof. Lee analyzes the prominent role Google is playing in the development of the right to be forgotten in the European Union. The Article conceptualizes Google’s role as a private administrative agency with quasi-lawmaking, quasi-adjudicative, and quasi-enforcement powers. The central insight of Prof. Lee’s theory of the private administrative agency is that corporations like Google may operate in a quasi-governmental, regulatory capacity in administering public rights on a global scale.